Things we did today...: We have "Arrived" To Cruising! Our 5’3” draft had me nervous. ( I know… you say “when am I NOT nervous?” ) Well, it was for good reason. The entrance to this bay is tricky and there are spots inside the anchorage that we would definitely NOT have a good experience! But after studying the charts and tides, we felt that entering the Bay at high tide and finding the deep spot well inside, would be fine. Even if it meant that we would cross the Charlotte Harbor Inlet at the peak of incoming tide, 2+ knots trying to sweep us from our course, we would do it. My research paid off. The incoming tide was a consideration, but Charts&Tides (US Gulf) one of our favorite iPad apps, showing our projected path brought us dead on right to the entrance to the ICW on the other side of the inlet. I LOVE technology! Right away, we were at the entrance to Pelican Bay. We turned towards the “sign” and then followed the beach… WAY too close, but in 9 ft. depths. Then we turned into the anchorage and headed towards the pier. I had a few “GULP” moments as the depths dropped below 6 ft. but soon we had arrived at the charted deep spot and they opened up to 10+. Hooray! We’re IN! The deep spot was visually marked by several larger sailboats, but there was PLENTY of room. In fact, this was MUCH easier than our anchoring experience at Longboat Key. The holding is excellent and we were set within minutes of arrival. Set for days exploring this beautiful place! We made a quick trip to shore to see what’s over there. 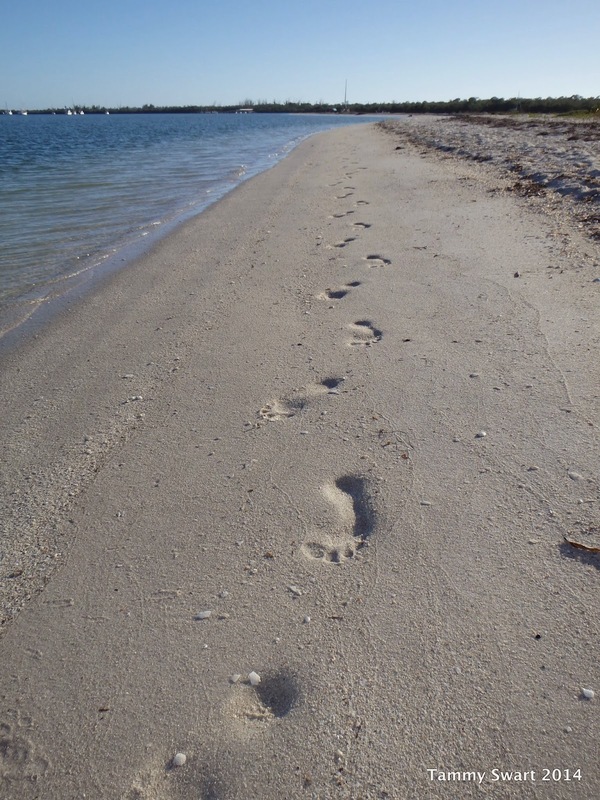 The Cayo Costa State Park is very laid back and I felt a very familiar Summer Camp kind of feeling. Very inviting and welcoming… There is a small park store and a ranger station here. Not much in the store, but we were able to pick up a tube of toothpaste (hooray, no baking soda for us). There is also a tram which takes beach-goers across to the Gulf side if you don’t want to hike. Nice place. We returned to the dinghy and moved on along the perimeter of the anchorage where we beached at the spit of shell on the NW side of the entrance. We explored the beach there, exfoliating our feet on the tiny shells… I was overwhelmed by the feeling of familiarity and peace of this place. It’s as if THIS is the place my mind created in all my reading and studying of what Cruising would be like. We thrilled at the discovery of thirteen big starfish! I was swept back to childhood days when my Uncle Nelson would take us with him to collect Zoo specimen for his work at the San Antonio Zoo. I picked up one starfish and felt it’s prickly feet as he tried to walk off my hand. This is the life! We walked hand in hand back to the dinghy and went back to the boat for a rendezvous with a sunset on our back deck. We have arrived to Cruising! The next morning looked perfect for a kayak experience. There was no wind as we gazed across the anchorage to see a small crocodile creating the only ripples on the water’s surface. Do YOU have a shadow selfie with fish??? We kayaked towards a break in the mangroves bordering the anchorage and reveled in the adventurousness of it. Suddenly, the pathway opened into a small cove where a few other kayakers could be heard talking about another crocodile. Finally I would have my ‘gator experience!!! While making our way around the edge of the cove, we realized that it was manatee we were seeing, and NOT a crock'! Even BETTER!!! Before coming to Florida on our boat hunt more than two years ago, I had never seen a manatee. In fact, I’m not sure that I entirely believed in their existence… I know… But really… think about it. They ARE kind of the stuff of a vivid imagination. We’ve been motoring past signs warning of “manatee zones” for weeks and have seen no sign of them. Where ARE all of these supposed elusive beasts anyway!? But, evidently they DO exist! We were suddenly surrounded by the giant slow moving beasts! Their shuffling along the bottom created mushroom clouds of stinky bottom sediment rising to the surface announcing their whereabouts. It was thrilling and frightening at the same time! I just froze when they began to splash around right in our path! It was just no-other-word-but-awesome! All at once, his pole bent and he had a fish on! I started snapping pictures, never knowing when the fish would break free and we would have missed the excitement of momentary success… but the fish stayed on! 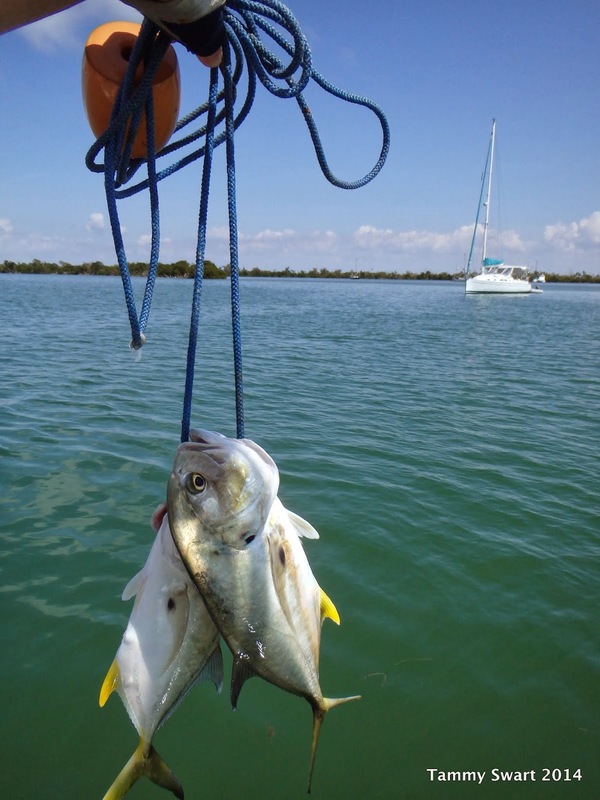 The beautiful Pompano allowed himself to be caught! He and another of his dearest friends both will be making their way to our dinner table very soon… WOW!! If yesterday was a Red Letter Day… what is THIS!? We sped back to the boat after finding no third fish willing to give his life for our enjoyment, and tackled the problem at hand of where to clean these slimy little darlings. No way were we bringing them onto the boat, they would have to lose their bodies before entry. So, we devised this little plan. 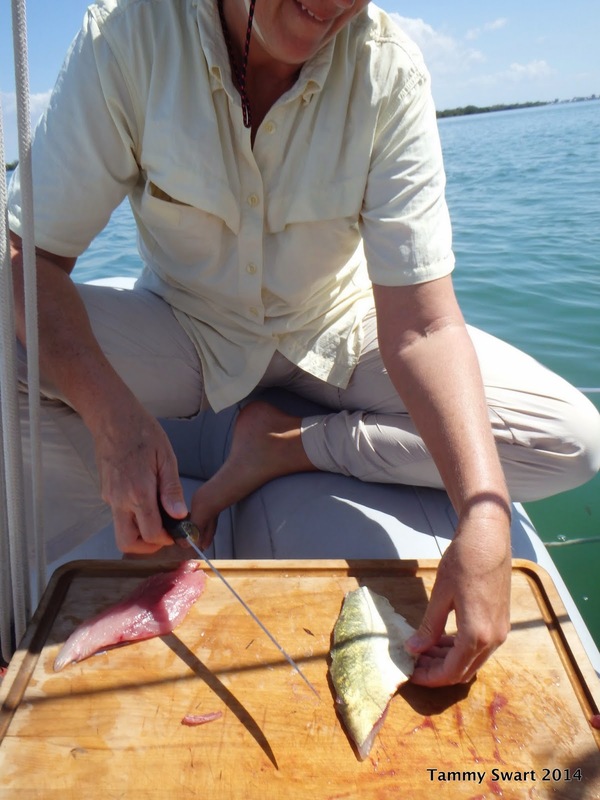 Bruce would filet them while sitting on the dinghy tied to the transom using our large cutting board for a work space. I, in turn, would skin the filets and there you have it! Pop those babies into the fridge to wait for dinner! But we weren’t done! There was one more white strip of sand for us to explore today. The opposite side of the Bay’s entrance beckoned to us. We found it deserted as we beached our dink upon it’s blinding white shores. I spread my beach blanket in the middle and proceeded to drowse in the late afternoon sun. Bruce tried his luck at fishing off the point, but it had evidently been all used up earlier, so he joined me on the blanket. Sunbathing has never been Bruce’s thing, so I asked him if he was bored. He said that he had thought so at first, but then asked himself what he would be doing otherwise… and found no answer… so, no, he was not bored. I like that attitude! We enjoyed a slow afternoon as the sun sank lower prompting us to return to the boat. We retired once again on the veranda, taking our seat for the sunset. Strangely, a bit of melancholy set in. It was as if all the excitement of the day had left me deflated somehow. I was almost homesick, but not for home… for something else entirely un-knowable. But I shrugged it off to being tired as our day had not included the nap to which we have become accustomed… We talked about all of the things we had experienced in recent days and were in agreement that THIS… is what Cruising is all about. We have arrived to Cruising. Man, this is just so cool! I love it that you saw a manatee. Definitely on my bucket list of animals to see, although I fear we may never make it to Florida in the boat. Those beaches are amazing. Great post! It will keep me going!